The ability to drill angled holes (sometimes called pocket holes) is helpful and even necessary for so many home-related projects. As just one example, you might want to toe-nail a two-by-four at a 90-degree angle into another two-by-four to create the framework for a wall, yet you don't have a lot of room to swing the hammer. Starting with a short angled pilot hole would help immensely by guiding the nail at the correct angle and reducing the amount of hammering needed. But drilling angled holes in wood comes with its unique set of problems. Perhaps the most frustrating problem is when the drill bit begins correctly, then quickly skitters across the wood and out of position. This is why you need to take special measures: either by purchasing a tool that will do the job for you or by adopting a technique with your drill that will greatly improve the possibility of a perfect angled hole. A drill press is the best way to drill a hole at an angle. But a drill press is an expensive, standalone tool that only lets you work on small pieces of material. Drill presses are poorly suited for so many home improvement projects because they cannot be moved from the shop. A good alternative to a drill press is a pocket jig. Pocket jigs, such as the Kreg R3 Jr., are cheap, simple devices that guide your drill bit into the material at an angle. If you need to drill more than a few holes, it may be worth purchasing a pocket jig. Pocket jigs are not foolproof, though. They still take practice on scrap wood before moving onto the actual work material. The manual method requires no special tools. Along with finesse and patience, you only need a corded drill or a cordless drill and two drill bits of different sizes. One bit is the size of the intended hole and the other bit is half the size of the intended hole. Use old bits, if possible, because sometimes drill bits will break. Softwoods, a category which includes most two-by-fours, work best. Hardwoods like maple, walnut, and oak are difficult to manually angle-drill. Rather than guessing at the angles, using a Speed Square helps you to strike a perfect angle. Just lay the square against the side of the board, tilt it to the intended angle, then draw a line on the side of the board. You will not be able to drill holes at every angle manually. Up to 45 degrees, you can easily drill an angled hole. Between 45 degrees and 15 degrees, the process becomes more difficult but not impossible. Lower than 15 degrees, the drill will move around too much. When the starter bit dances too much, you cannot establish enough of a starter hole to complete the rest of the hole. First, decide on the size of the intended hole, then choose a bit that is about half of that diameter. For example, if you want a 1/4-inch diameter hole, choose a starter bit that is around 1/8-inch or even a bit less. Just be cautious of using extremely thin bits, as they may break. 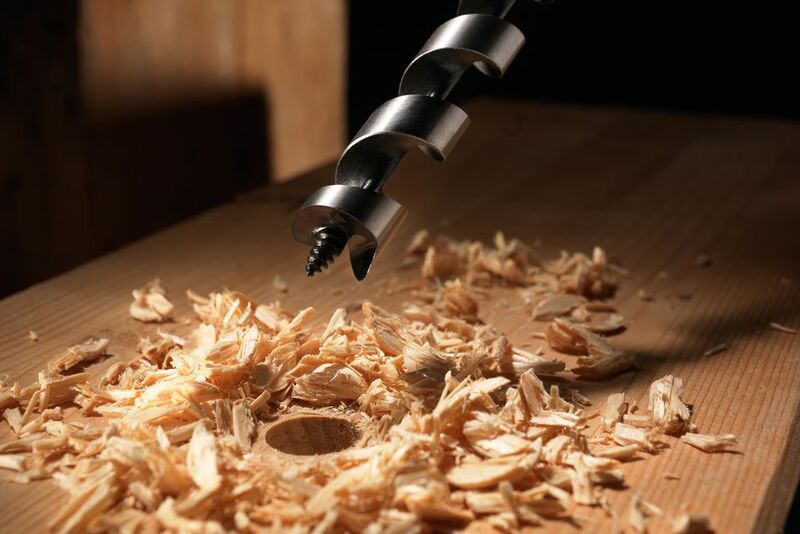 With that starter bit in your drill, begin to drill a hole in your material at 90 degrees but do not complete the hole. Stop the drill when the bit is about 1/16-inch to 1/8-inch into the material. The aim is to produce a hole that is not so long that it fully establishes the 90-degree angle. If the hole is too deep, you will not be able to perform the next step of changing the angle of the hole. With that bit still in your drill, remove the bit from the hole. Move the drill to the desired angle. Place your bit back in the hole. Make sure that the bit is firmly seated in the hole. If it is too close to the edge, it will lose grip and skitter away. If it is too deep into the hole, you will not be able to move your drill at an angle. Now drill the hole, maintaining a slow and steady speed. Remove the bit from the drill. Change to the larger bit of the desired diameter. With the correctly sized drill bit, enlarge the angled hole. Go as slow as possible. High speeds may cause the bit to move away. Also, the heat produced by friction at high speeds may contribute to bit breakage. What is the Correct Method for Using a Screen Installation Tool?